How to equalize the sides and get a political win? Bring in a black woman. Enter Anita Hill. 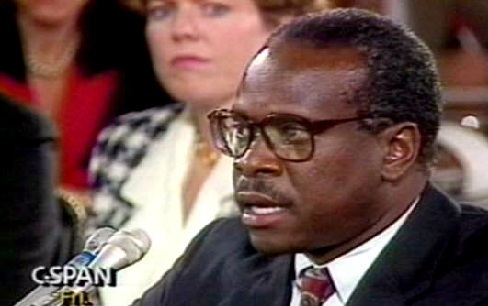 Now, 23 years after the combustible confirmation hearings in 1991, a ‘documentary’ about Clarence Thomas accuser Anita Hill. Make no mistake this is an attempt to reframe this sorry event and rewrite history about Clarence Thomas and the women’s movement. Because this episode launched so many on a journey to conservatism–me, Andrew Breitbart and the man who worked for a liberal Senator who outed Anita Hill and tens of thousands of others– I believe the left now chose to rewrite this seminal event for a new generation, a generation which doesn’t know this history and the disgusting put-up job this was. As a reliable liberal, after watching this spectacle the scales fell from my eyes. I was disgusted that the party which purported to be on the side of the blacks now felt politically impelled to destroy one. I found myself agreeing with Thomas after he issued a statement in his defense after the Senators’ parade parade of innuendo. A second, and I think more important point. I think that this today is a travesty. I think that it is disgusting. I think that this hearing should never occur in America. This is a case in which this sleaze, this dirt, was searched for by staffers of members of this committee, was then leaked to the media, and this committee and this body validated it and displayed it at prime time over our entire nation. How would any member on this committee, any person in this room, or any person in this country, would like sleaze said about him or her in this fashion? Or this dirt dredged up and this gossip and these lies displayed in this manner? How would any person like it? This is not a closed room. There was an FBI investigation. This is not an opportunity to talk about difficult matters privately or in a closed environment. This is a circus. It’s a national disgrace. They lost me. The hypocrisy of these liberal bastards was breathtaking. Just a few years later these same political pugilists–the women’s movement and the liberal lions of the Senate –would support Bill Clinton when he lied to a federal grand jury about his predatory sexual behavior. Note the screen shot of this mockumentary is of a white Senator supposedly picking on the poor black woman Hill. Nothing could be further from the truth unless you want to talk about Senator Howard Metzenbaum–a white LIBERAL man–who outed Hill and forced her to testify in an attempt to scuttle Thomas’ nomination. I’m personally offended by this attempt to rewrite history. This is an attempt to besmirch as uninformed, those who witnessed this spectacle and who concluded–accurately– that the left cared more about naked identity politics than preserving the reputation of an honorable black man who was brought up by his sharecropping Grandpa and then rose to the heights of American leadership. Thomas was the great American success story, but the left couldn’t abide a conservative black ascending and replacing liberal justice Thurgood Marshall–a legal (and black) icon. Instead, the left tried to metaphorically lynch him. It was a shameful time and it outed Kennedy, Biden and Metzenbaum et al for the cowards, racialists and liars they were. A Metzenbaum staffer who was so disgusted by this orchestrated, dishonest spectacle, eventually wrote a book about his experience. He entitled his book, Leaving the Left. That mindset, more than anything, is the reason for the historical rewrite of this shameful episode of liberal duplicity. 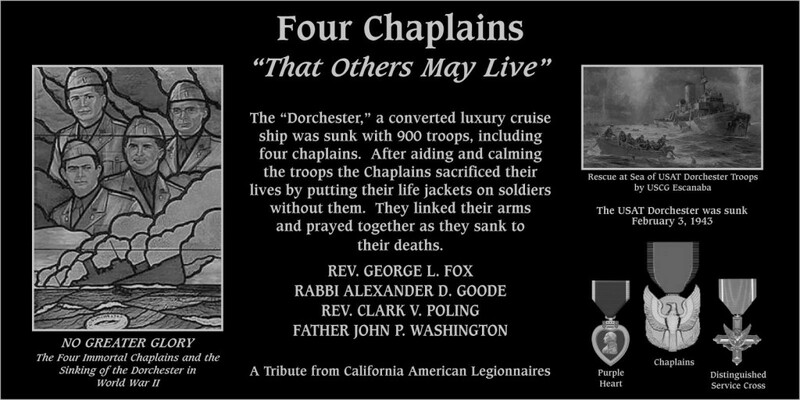 American Legionnaires, and other veterans and patriots, will commemorate the service and selfless sacrifice of the Four Chaplains by establishing a plaque in their honor at Mt. Soledad National Veterans Memorial on “Four ChaplainsDay,” February 3, 2014, at 1 p.m.
February 3 is national Four Chaplains Day by Act of Congress in 1988. However, it is generally ignored by news media, not taught in schools, and not observed by government entities. Consequently, most Americans do not know who the Four Chaplains are, why they are honored, or even that there is a national Four Chaplains Day. 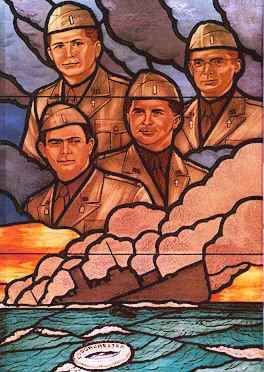 Therefore, in part to rectify that, wartime veterans of the California American Legion, other veterans and patriots, have unified to create a permanent and enduring reminder of the lives and heroism of the Four Chaplains by dedicating a granite plaque in their honor at Mt. Soledad. The awe-inspiring selfless heroism of the Four Chaplains — Rev. George Fox (Methodist), Rabbi Alexander Goode, Father John Washington (Roman Catholic), and Rev. Clark Poling (Dutch Reformed)-–led Congress to award each a Purple Heart and Distinguished Service Cross in 1944, and an unprecedented Congressional Medal of Valor in 1961. The American Legion continues to advocate that the Four Chaplains should be awarded the Medal of Honor in an exception to the rule that it can only be awarded to combatants. San Diego Attorney Charles S. LiMandri will be the keynote speaker. He, as Western Region Director of the Thomas More Law Center and currently as Director of the Freedom of Conscience Defense Fund (FCDF), is credited with doing more to save the Mt. Soledad Veterans Memorial “as it is, where it is,” than any other single person. Congressman Duncan Hunter will speak in honor of the Four Chaplains unless required for a vote in the U.S. House, in which case a representative will speak for him. Larry Wilske, Special Operations Master Chief [SEAL] (USN, ret.). Dr. John Steel, former Navy fighter pilot, renown physician and surgeon in San Diego, and one of the first supporters of the Mt. Soledad Memorial. Victoria Taft, patriotic broadcast journalist and radio talk show host, who for years annually broadcast a Four Chaplains Day tribute on Feb. 3. Harry M. Woods, Commander, and Anthony Stewart, Vice Commander, will speak for host American Legion District 22 (which covers all Posts in San Diego County). Ray Trosper will represent Riverside Post 79 which initiated the Four Chaplains tribute at Mt. Soledad. He is Post 79 Sgt.-At-Arms; Chaplain of Post 79’s American Legion Riders (ALR); a Patriot Guard Rider (PGR). –Los Angeles County Supervisor Michael Antonovich (5th District), a veteran (Army) and American Legionnaire, long a supporter of Mt. Soledad “as it is, where it is,” and leader of the effort to restore the cross on the Mission Church on the L.A. County Seal, which is now depicted without its cross as the result of lawsuit threats by the ACLU. –Col. Antonio Monaco (USA, ret. ), founder and CEO of Patriot Outreach (www.PatriotOutreach.org.). –Dan Smith (USMC, ret. ), Chairman of the Board of Military Honor Details at Riverside National Cemetery.